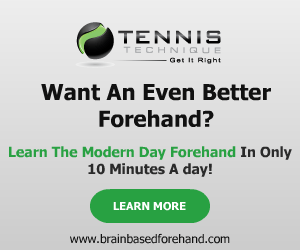 Tennis student Rina is highlighted in this Dartfish video analysis side by side a pro tennis player before technical instruction in August 2008. This is followed by Rina’s advanced technique after one hour, four, and nine months of coaching with Charles "Bud" Cox. Rina (and her brother Ken) have the potential to be excellent tennis players. I first saw Rina play against one of my former students a few years ago. Rina was a beginning tournament player, but I could tell she had the work ethic to improve and become an exceptional player. Since I began working with her, she has exhibited the effort that it takes to reach higher levels in tennis. After Rina’s parents asked me about coaching her, I agreed to do an evaluation tennis lesson for them. Rina led with the tip of her racket on the forehand take back, so she was tight in the wrist, thus not hitting the ball with much spin. We went to work on leading with the elbow and keeping the racket face up to the sky. On Rina’s backhand we worked on taking the racket back with the body, instead of her arms. This slight adjustment helped her get the racket in the correct preparation position time and again, even in tight situations. It’s optimal to have "one form" on the swing…not a hundred different swings. This will promote consistency over time. We had a little work to do on Rina’s serve. She extended up with both hands, which hindered the correct rhythm that allows the kinetic chain to fire properly. She began to lead with the left hand, and explode up at the contact point. She also improved her ending now that she was landing in the court. Rina has worked on her forehand and backhand volleys, and she has made some big improvement. She keeps her racket head up nicely on the forehand volley. She has developed a nice backhand volley with both arms extended straight after contact. This form will help take her as far as she wants to go with her tennis. Tennis student Rina has a great work ethic at each and every practice session, which will pay off over time. She comes to the sessions ready to play. This shows me that she likes the game of tennis and that’s a big part of avoiding burn out. Tennis is a game of a lifetime, so we want the kids to enjoy the work that it takes to reach their goals. Rina was ranked 187 in the girls 12s in Georgia when I started working with her in August 2008. She wanted to reach the top 50 very quickly and she ended up with a high of 21. She should move up further in the next age group as she continues to develop.